I have used Murad before and my skin is always spectacular afterwards! I love the brand! Perfect review!! I knew this brand!! Great Brand I been using them for a long time their customer service is outstanding also I need to find this I use their facial wash and moisturizer and acne spot my favorites. I have heard many good reviews of this brand! Must try it. This moisturizer sounds really good. Thanks for trying it and the review. Enjoy the rest of the week. this would be perfect for dry winter days, too I bet! glad it worked with your skin! Sounds like a great product Kim! Lol at raisin face! Great analogy. Girl, my skin always need an "extra sumthin' sumthin'" I have to make sure I say it right. I love how you describe the product. And for somebody who spends a lot of time in the house, I think I should start using my humidifier, too. I always have trouble saying that word. LOL! I definitely need to get my hands on some of this, Kim! My skin always seems to need an extra something - actually it's probably fine but I have my photo taken all the time so I really notice any changes - but especially in the winter months. Great review! 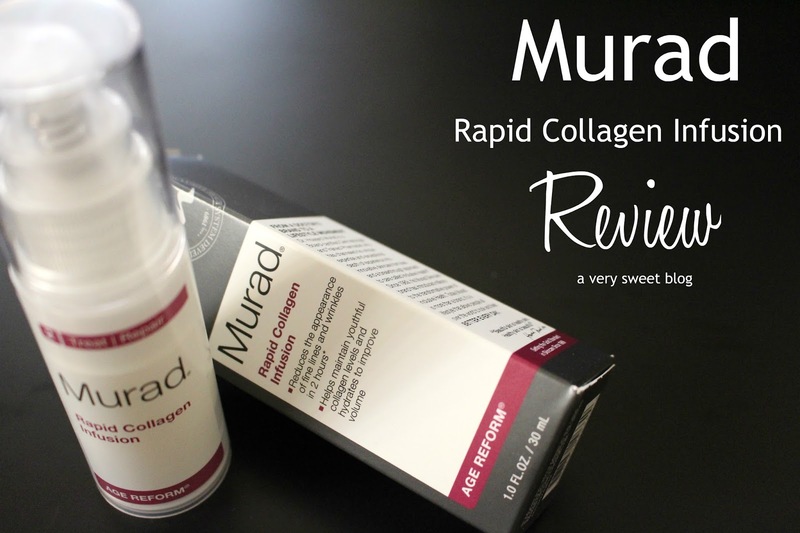 I have used a couple of collagen products in the past but they seem to plump me up too much! Maybe I should try them again. My laugh lines aren't my favorite thing on my face! Ooh, I don't think I've tried this yet! I generally like Murad products very well. I totally agree about needing an extra boost of hydration in winter! Great review! I'm always impressed with how well Murad products deliver. This sounds wonderful. This looks awesome! Definitely a holy grail skin product. Awesome review! Adding this to a (long) list of things to try! Since moving to Florida, I've noticed I've been getting those little lines (grrr! So much sun here LOL). This sounds like a godsend Kim, especially if I'd have to break the bottle, waste not want not, 'eh? haha. Happy New Year. I received a 5mL sample size of this before and I adore it but as always, I have forgotten about it by now so thank you for the reminder, Kim! And glad this received a positive review from you because I remembered it as really good too. You are too cute, Kim, you had me cracking up when you said, "no need to have a raisin face." Haha! You are so right, though! It's so important to take good care of our skin, especially by frequently moisturizing! I'm glad you liked the response of the product. I hope you had a lovely day and thanks so much for sharing! This sounds nice Kim! The dry air in the winter even makes my usually oily skin dry! I need something like this in my life lol!! I really should use my humidifier more too, but I'm so lazy to fill it up every night lol! Such a great review and I think it's always good to have those 'break in case' products. I use Murad's Vitamin C peel a couple times a week when I'm feeling really tired and it always makes my skin look a little more awake so this is one I definitely need to try too. And eventhough Kylie's lips are fake, I do wish there was a magic product to plump my lips sometimes hehe! Oh well...lip liner for now. Like you mention it's like a 911 kind of product that's good to have around. Lately I have not purchased any face products as I have been living off samples !